Oy Woikoski Ab, a Finnish family-run business, is investing heavily in the creation of a hydrogen society. The company has opened a second hydrogen filling station at the Vuosaari Harbour in Helsinki. The station was inaugurated by Minister of the Environment Ville Niinistö. Finland’s first hydrogen car and filling station were introduced at the Woikoski main office in Voikoski earlier this year. Woikoski has produced hydrogen for 101 years; only the production methods have changed. Hydrogen is derived from water through electrolysis, from natural gas or biogas through steam reformation, or by using the hydrogen generated as a side product, e.g. in various chemical industry processes. Woikoski saw the potential for using hydrogen as a fuel in cars as early as the 1930s, when a hydrogen-fuelled prototype car was frequently seen on the roads near the company’s factory in Voikoski. The hydrogen filling station in Voikoski is the result of Woikoski’s own innovation, which aims to conquer international filling station markets. The station fills the car’s tank using either 350 or 700 bar pressure. The filling is completed in a few minutes, and a full tank lasts around 600 kilometres. 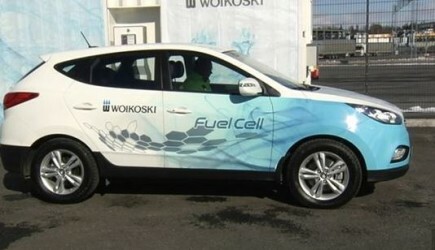 Woikoski is heavily involved in the development of a hydrogen-fuelled society, and has created the conditions for introducing a zero-emission hydrogen car into the Finnish market. Use of hydrogen would significantly reduce the CO2 emissions of the automobile industry. A number of hydrogen-driven cars, buses, and forklifts are already in use in Europe. In addition, noise emission can be reduced by means of fuel cells, e.g. in snowmobiles and water vehicles. Woikoski is investing heavily in hydrogen production, logistics, and user applications. A hydrogen car and filling stations are just some examples of the company’s hydrogen-related investments. In summer 2014, a new hydrogen factory will come into operation in Kokkola Industrial Park. At the same time, the modern hydrogen transportation units based on composite technology will come into use. Woikoski believes that the use of hydrogen technology in the energy sector will sooner or later take off, providing an eco-friendly alternative to electricity. The company is working in cooperation with the Finnish Funding Agency for Technology and Innovation (TEKES), Lappeenranta University of Technology, and VTT the Technical Research Centre of Finland. VTT facilitates cooperation with Fukuoka University in Japan, which is home to the world’s leading hydrogen research institute. If it is willing to make the effort, Finland can become a European forerunner in the use of hydrogen as fuel. The alternative fuels infrastructure directive is currently under discussion in the European Union, and will be put to the vote on 14 April 2014. The directive will not bind the member states regarding hydrogen, but gives them the option to set targets relating to a distribution network, to be reached by 2025. Common standards for the entire EU area have already been agreed upon. The member states must submit national plans to the Commission by spring 2016. In Finland, the preparation of the plan will start in the Ministry of Transport and Communications during the spring. Founded in 1882, Oy Woikoski Ab is a Finnish pioneer in the gas sector. The family company produces gases for the industrial, medicinal, and foodstuff sectors and also provides specialized gases, and products to the welding industry. The company has nine offices and 170 retailers and also exports to Russia and to the Baltic countries and other parts of Europe. Woikoski greatly values continuity, sustainable development, self-sufficiency, and the wellbeing of its staff.